When I was a little kid my father insisted—yes insisted—that I eat my Marmite. The news is hot enough for the British media, from the tabs to the respected national broadsheets to the BBC, to relegate Justin Beiber to the back pages (now that he’s out of jail) and collectively express their amazement that this country would not only have a drunken, crack-smoking mayor for its largest city but that Canada would actually ban something most people in the world consider not just a comfort food but healthy. According to media reports, the CFIA doesn’t like Marmite because it may—repeat may– be illegally enriched with vitamins and minerals, even though the label doesn’t say that. So why did my father insist that I eat Marmite? Why did he say it kept him alive? My father was a prisoner of war on the Burma Thailand Railway, where allied prisoners, starved by the Japanese were forced as slave labourers to build the infamous “Railway of Death.” (The story made famous for an older generation in the Oscar winning movie Bridge on the River Kwai and chronicled in my book A River Kwai Story: The Sonkrai Tribunal). The Japanese kept the slave labourers, both POWs and local forced labour on a minimal starvation diet. One of the problems was that the Japanese served polished rice which, in combination with the lack of other food, created a Vitamin B deficiency. Polishing removes the outer husk of a grain of rice and it is that outer husk that is rich in vitamins. That Vitamin B deficiency causes a disease known as beriberi. Symptoms of beriberi include weight loss, emotional disturbances, impaired sensory perception, weakness and pain in the limbs, and periods of irregular heart rate. Edema (swelling of bodily tissues) is common. It may increase the amount of lactic acid and pyruvic acid within the blood. In advanced cases, the disease may cause high output cardiac failure and death. Today beriberi is rare, found usually where people have been displaced by war or natural disaster and have no or little access to proper nutrition. In even rarer circumstances people with HIV/AIDS or eating disorders may show symptoms of beriberi. The POWs desperately needed a source of Vitamin B and luckily, at least at the beginning of their imprisonment in Singapore, the city had large stocks of Marmite, which were recovered from warehouses in the city and stored, then rationed to the prisoners. 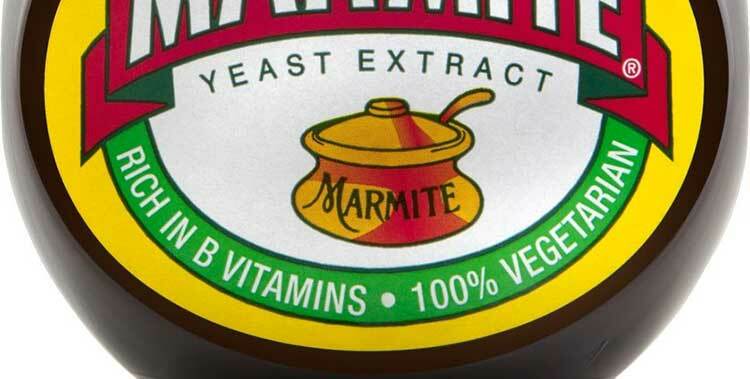 Marmite is a yeast extract, a healthy by product of brewing beer and thus is very rich in Vitamin B.
UK label for Marmite says it is 100% vegetarian. According to most media reports, the CFIA intercepted a shipment bound for Brit Foods in Saskatoon, Saskatchewan, then local food safety officials raided the store and removed the offending items from the shelves. The other items banned are all favourites in Britain including Ovaltine, Bovril, Lucozade and Penguin bars. Bill Hotchkiss, owner of Mrs. Bridges’ British Bakery in Toronto, told CTV News that the crackdown is going even further. Hotchkiss has been operating his store for 20 years, but says crackdowns in the last five years have made it hard to keep his small business afloat. The problem, he says, is that CFIA rules on imported products are constantly changing, and shop owners aren’t made aware of changes on restricted ingredients. Hotchkiss says products that contain certain food colouring have been barred, but he says he has been most affected by crackdowns on fish products. Customer favourites such as fish paste, salmon spread and pressed cod, which were sold in his store for about 10 years, have recently been taken off the shelves because they don’t meet CFIA regulatory requirements. The CFIA, of course, is the same agency that considered listeria and other problems in Canadian meat a public relations problem rather than a food safety problem. It also appears that CFIA is aiming at those who have few resources to fight back like British specialty stores. I get my Marmite at Overwaitea, owned by entrepreneur Jimmy Pattison. So far no reports of the CFIA taking Marmite off the shelves of the big supermarkets. 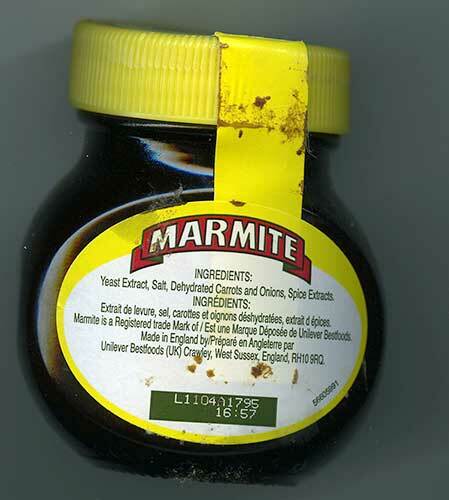 There are no reports of the CFIA cracking down on the Australian version of Marmite, called Vegemite, created by the Aussies in the First World War when they couldn’t get Marmite. Australians are weaned on Vegemite, every Aussie friend I have is addicted to Vegemite. When I was living in London in the early 1980s New South Wales House had a huge display of Vegemite in its window. Warning to Stephen Harper, if the CFIA continues with this ridiculous crackdown and extends the Marmite ban to Vegemite, it is highly likely that Australia will break off diplomatic relations (at the very least). It took 48 hours of world wide coverage for the vaunted Stephen Harper media machine to wake up and realize the world was paying attention to this story while was gazing at the ruins of Petra. Irn Bru and Marmite are not banned for sale in Canada. These products have been available on Canadian store shelves for more than a decade and will continue to be sold in stores across Canada. Recently, a shipment containing a number of products imported from the UK was detained in the course of regular border activities because it contained meat products that were not accompanied by the required documentation. Appropriate certification of meat products is required to assure food safety and protect animal health in Canada. The CFIA determined that the rejected shipment also included other products, including Irn Bru (drink) and Marmite (a yeast-based spread). Imported products, including Irn Bru and Marmite, that meet Canadian requirements under Canada’s Food and Drug Regulations are and will continue to be available for sale in Canada. The CFIA will work with the food seller to ensure they are accessing the correct products, destined for Canadian markets. Food safety remains a top priority for the Government of Canada, and is the primary focus of the Canadian Food Inspection Agency’s (CFIA) food inspection action.